Sidney was born in Newbury, Berkshire the son of Sydney CUMNER & Hannah WRIGHT. He was baptised on 25-Nov-1827 at St. Nicholas, Newbury. Beteween 1846 & 1867 he was a private in the 36th Regiment Foot. On 20-Dec-1859 he married Miriam Crane MATTHEWS[B-Cert] at Stoke Damerel, Devon[M-Cert]. In 1881 he was serving as a butler at the Royal Military Accademy at Sandhurst. 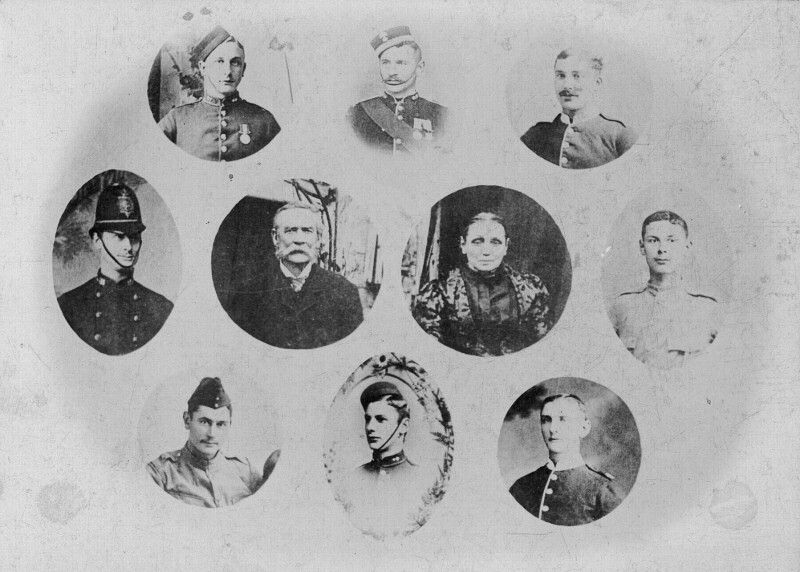 Sidney CUMNER & Miriam Crane MATTHEWS with their 8 sons in uniform. From the policeman on the left going clockwise: Thomas William (b. 1861), Frederick Charles [Royal Artillery] (b. 1878), Arthur Sidney [Grenadier Guards] (b. 1862), Alfred George [Leicestershire Regiment] (b. 1867), Christopher [3rd Royal Berkshire] (b. 1886), John Henry [Leicestershire Regiment] (b. 1870), Ernest Edward [Royal Artillery] (b. 1876), Richard Herbert [Labour Corps, Nottingham] (b. 1872). Sidney wasn't in the 1871 Census but Marion was shown as married.